Mrs Delcy Young, née Banner, was born in Lemonal Village and attended the St. Luke’s Anglican School in that village. From an early age, it could be perceived that she was determined to excel. She did practice teaching in her early pre-teen years and was appointed as a teacher when she became a teenager. In 1974, she got married to Peter "Walla" Young, a police officer. The young married couple moved to Belize City where they embarked on the journey of married life. 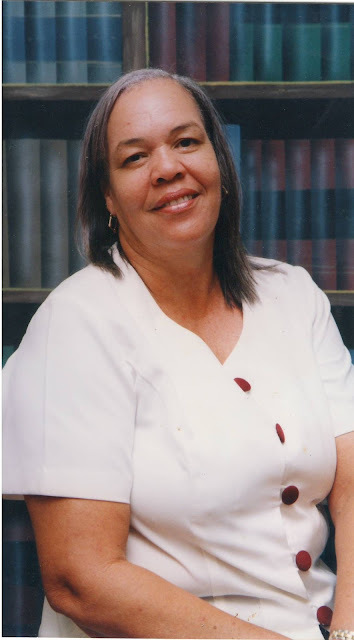 Mrs Young started teaching at All Saints Anglican School soon after moving to Belize City. While there, she was successful in the required teachers’ examinations and because of her success, she was accepted into The Belize Teacher's College. Toward the end of her stint at Belize Teacher's College, her husband's job transferred him to Libertad Village, which forced her to start and end her internship at Libertad Roman Catholic School. After graduating from the Belize Teacher's College, she again moved to Belize City with her husband. In 1988, she applied for a space and was accepted at Holy Redeemer School, where she is presently one of the administrative principals at that institution. During her career, she has received many awards and recognitions; she is also an appointed Justice of the Peace. In 2010, Mrs. Delcy Young was honored by the Belize City Council in recognition of 41 years of dedicated service to the people of Belize as a teacher. As a result, a street in Belize City was given in her name. DELCY YOUNG STREET is located in the St. Martin De Porres area of Belize City. Mrs. Young is extremely devoted to Schools and Church affairs. She has participated in many extracurricular activities at many Schools throughout the country of Belize. Mrs. Young is also a divine worshiper and follows the teachings of the Catholic Faith. She respects authority and has gained respect from those she has come in contact with throughout her extensive career. She will reach the retirement age in June 2011 where she will leave a profession she loves dearly. Not only will the teaching profession lose a valuable and inspirational member, but a wealth of experience and humble characteristics will be leaving the class room as well. Mrs. Young will be missed by administrators, managers, teaching colleagues, friends and students. She has done what was expected of her and has gone above and beyond in ensuring that the students that came in contact with her leave with the best education she could have provided them. Delcy is married to Peter Young, they have five children and three grand-children. We, her family and friends, wish her a happy retirement. We should all pattern our lives in any small way after who she is. I have always proud to call her cousin, friend and a big sister. She have proven herself worthy to me over and over why she's all that to me. Delcy's behavior towards mankind causes her to be called by me,little jesus on earth. I am so proud of my cousin for achieving this fantastic goal.Delsey I wish you the best in whatever you decide to go for in your life time. Have a wonderful and happy retirement Delcy Banner-Young. You deserve it. Arlene and I have been with you through out the years and you have really been a Good human being and a really good patient teacher. May God continue to bless you now and always. Peace and love. You've done well dedicating all your life to such a noble profession. Thanks to all the comments sent by my relatives and friends. I really appreciate them. God Bless! Congrats on your retirement Ms. Delcy. The many lives you have touched during your tenure will be truly remembered. It's time now to sit back, kick your feet up and enjoy!!!! Congratulations on a great career...all the best wishes for the future. She's an exceptional woman! Proud that she's my auntie. I am happy for you my cousin, congratulation on all you have achieved.I wish you and your family the best in the future ahead to come, may you enjoy the rest of your life with the help of God and that he continued to bless you and your family. love you always!